Any full Moon represents either the culmination, or we might say fruition of a relationship, or the end of it. There is much talk about lunar cycles and how they ought to affect us as individuals, but rarely is there a recognition of the basic implication of Sun and Moon when it is discussed. Sun and Moon are, at their most archetypal, male, female, father, mother, husband and wife. This is why a true understanding of the distinct phases of the Moon has to encompass the way in which we relate to one another as human beings. At the full moon, the meanings and implications of relationships are released so that they can be fully seen. From the new moon forward the energy in a relationship or situation builds and at the full moon the energy is released: for better or worse. When astrologers talk about the new moon as being a good time to start something, and the full moon as a time of fruition, they often fail to appreciate that Sun and Moon fit into the wider patterning of human gender roles, and the natural cycles of relating. It is true that from the new to the full moon, energy is in a building phase, but it is also an unconscious phase because we cannot see what has been developing beneath the surface to finally be born into consciousness as the full moon ripens what was previously conceived. So the full moon is not so much a time of endings as it is a time of changing perspective and seeing if what was fermenting is at all palatable. It becomes an ending if we decide that the energy we have been building is not good. If it is good, we are not so much in a time of ending as a time of sharing. The coming full moon is not easy. With a tee square to Pluto and Moon’s conjunction with Uranus, the child of this lunar cycle is extremely challenging and will erupt violently and rather shockingly into consciousness. This is not such a problem if you are the type of person that enjoys profound and unexpected change, but if you are resistant, then it will be tough. The broad scope of this Sun-Moon opposition suggests that it is strongly focused on matters of relating, because that is the basic consistency of any Sun-Moon contact, and because the Moon falls in Aries and the Sun in Libra. Here there is a sudden and perhaps deeply uncomfortable realisation about a particular relationship. If the change in it feels right, then maybe it will be a keeper, but it will be a struggle in any case. One person wants to go their way, while the other is offering compromise, either position is being challenged, but – and here is my advice – compromise is the way to go: here’s why. The Moon in this picture is weak. Even though the Sun is in his fall, he has other factors at work which lend him considerable strength, while the Moon has almost nothing going for her. The Moon will react, probably explosively, but in the long term she will lose out. The Sun is ruled by a strong Venus and the Moon by a strong Mars, but in broad terms Mercury and Saturn are the strongest energies at the full Moon time, so communicating in a mature and responsible manner is the way to go, and Sun has that role. Moon conversely is very hot-headed and uncooperative. Much depends on where you are. The chart at the top shows the London full Moon: it’s broadly relevant for most of the UK. The chart below, is the full Moon chart for New York. That’s a very different story. In the UK chart, the challenge from Pluto is not very strong, because Pluto hasn’t got too much power here. The pressure of the US full Moon is considerably greater (although I haven’t cast the chart for the West coast). 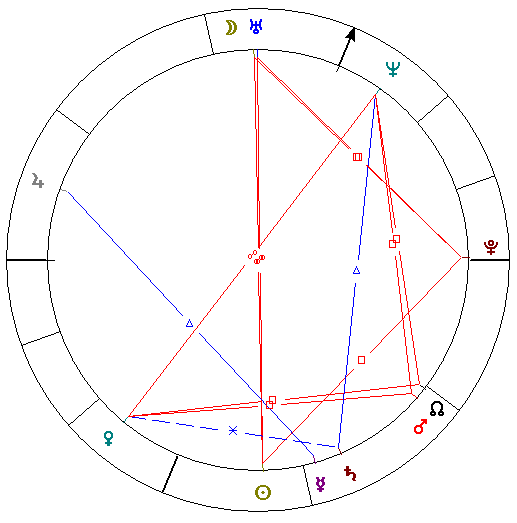 Pluto is applying to the 7th house and is right on the angle here and has more power. The same goes for the Moon, she is stronger because Cancer is rising. There are many permutations, but the point is, the full Moon is different wherever you are. The full Moon always has a basic flavour: relating, a culmination and either a letting go or a sharing, but it also has this other way of applying energy, and that is very much dependent upon where you are. The full Moon then has another dimension, and that is where the planets fall in your own nativity. In my view, there is a strong issue with property in the UK chart. I think that one example of how this energy might manifest is through taxes – a strong Plutonic motif – on property, (Pluto falls at the cusp of the 5th house – therefore luxury homes). 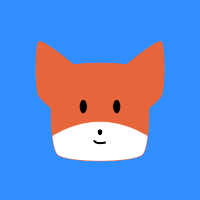 The people are likely to get mad about this issue now, and the authorities will offer a seeming compromise and soothe the situation in that way. This same kind of strategy will serve individuals as well. If you are dealing with somebody who is having a strop, then be conciliatory, offer a compromise and be the grown up. That way you will survive and quite possibly thrive. The US chart seems considerably more fraught than this, there is a sinister enemy in the making here and reacting in a hot-headed manner will lead to a major fall. You can get a better picture by looking at where this full Moon falls in your own chart, and remember, mature, reasonable communication, offer a compromise, be the grown up. You’ll be fine. So happy you are writing here again on your blog. Also…in the middle of reading Orcus and it is really an eye opener. To think that Orcan energy is so powerful and carries such a profound impact with it and yet can remain so under the radar! Thanks Catt, so very glad you are enjoying the book. It is amazing isn’t it, just how ‘big’ Orcus is. All the best. Hah! 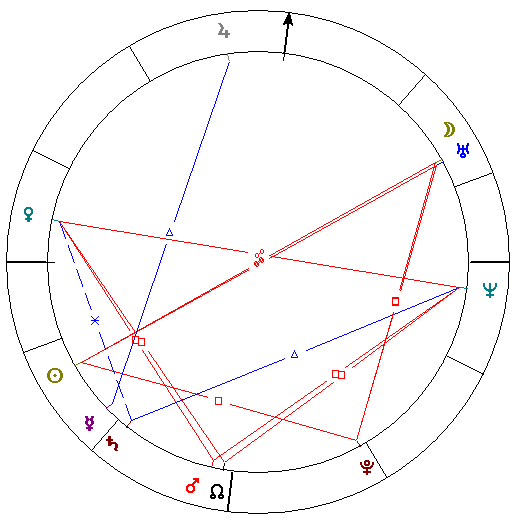 The US EDT full moon is on my natally grand squared Sun (Cancer)-opp-Saturn (Capricorn)-squared Moon/Snode (Aries) to NNode (Libra). I feel as though I’ve been gestating to a new-rebirth lately. Quietly anxious as those last days of pregnancy often are. I discovered that Ceres is in 12th conjunct (in my opinion) the chart’s Cancer ASC. Personally, I’m looking forward to a cooling, rainy day with lots of cooking in the kitchen ! I’ll keep the BBC on for word on the world outside! I enjoyed the article on Orcus which is partile conjunct Cancer sun 8th, so it’s in my natal mix with this Moon as well. I look forward to receiving upcoming comments and articles. What does “having a strop” mean? That is so humorous, as so many who “throw a strop” will deny it ever happened! I hope everyone’s full moon was “strop-free”.